Prof. Daniel Aliaga and his students, Alvin Law and Yu Hong Yeung, will be featured in a mini-documentary from the Discoveries and Breakthroughs Inside Science (DBIS) branch of the American Institute of Physics. The film will be released in November for nationwide distribution to local TV newscasts. It will highlight a project in which Aliaga and his team alter the physical appearance of cultural heritage artifacts. DBIS is supported by a coalition of scientific and engineering professional societies and a generous contribution from the National Science Foundation. DBIS promotes awareness of and appreciation for the role science, technology, engineering and mathematics professionals play in our daily lives. Aliaga's work, done in collaboration with the Eiteljorg Museum of American Indians and Western Art and with the Indianapolis Museum of Art, allows museum visitors to step back in time and experience pieces as they were originally intended instead of in their less than pristine condition. Physically restoring objects of significant historical importance is a painstaking and difficult process and, if not carefully done, can cause more damage to an object. 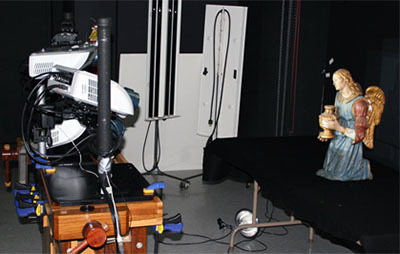 Aliaga’s method enables a completely novel form of virtual restoration that circumvents the potential for ethical dilemmas caused by physical alteration -- appearance changes do not require the physical alteration of the object rather are generated with adjustable digital light sources, are produced immediately, and provide an ability not previously possible when studying historical artifacts. Further, since only the naked-eye is needed (i.e., no special viewing devices or goggles), it provides a very intuitive and natural method of interaction which exploits the natural cues of depth perception and physical inspection, and enables a collaborative experience. Multiple participants can simultaneously experience new physical appearances and visualizations, all within a few seconds! Suddenly objects can look as they did 2000 years ago. The process uses a digital camera to capture a picture of the object. The digital picture is then processed by a computer which calculates the position, color, and light intensity needed to alter the visual appearance of the object to a new desired look. Several digital projectors illuminate compensation images onto the object so as to produce the desired new appearance. The technique can be used to create new appearances on almost any object. Current research is investigating, how to extend the method to highly reflective and semi-transparent objects and to textured surfaces such as hair, cloth, and feathers, and how to exploit aspects of human perception to enhance the illusion. Appearance changes can also include several forms for information visualization on top of the actual object. For instance, sub-surface analysis data, chemical analysis results, material compositions, and choroplethic maps can be mapped to the object’s surface. This setting provides a very natural visualization mechanism where analysis data can be directly and spatially associated with the object. More information and papers about the project can be found at http://www.cs.purdue/homes/aliaga or http://wiki.cs.purdue.edu/cgvlab/doku.php?id=projects:virtual_restoration.